She says it’s great to see the value of teachers’ work being recognised. 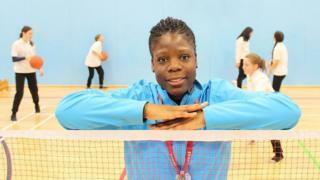 As a footballer she played for Chelsea and Arsenal before signing for Spurs – and in teaching she has also been a top performer, with a strong record in results in sports qualifications. As a teacher, she says “every day is a lesson”. And combining teaching with football, she says can feel like trying to live the lives of two people. She lives close to the site of the Grenfell Tower fire – and says that when she saw what had happened she began to raise funds. “I hoped to raise £5,000,” she said. But in the end she collected £80,000 and then a school’s sports day and support from local businesses took the total to £100,000. “It’s my community, it was a natural reaction, my people needed help,” she says of the efforts to support survivors. Tuesday Humby, principal of Ormiston Chadwick Academy, Widnes, Cheshire. She has helped to widen the horizons of disadvantaged pupils, with an “enrichment charter” which offers residential trips, theatre visits and an overseas trip to Kenya. Last year’s winner was Maggie MacDonnell, who teaches at a remote village school in the Canadian Arctic and who has campaigned about the problem of youth suicides in the Inuit community.